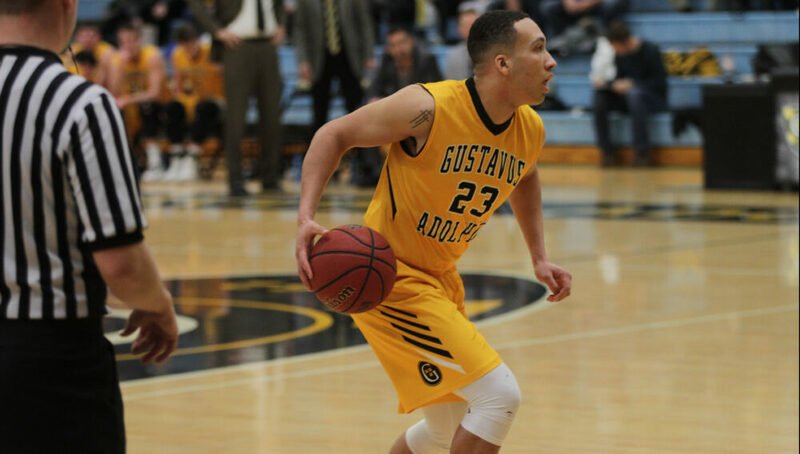 MINNEAPOLIS, Minn. – The Gustavus men’s basketball team traveled to Augsburg on Wednesday night and fell by a score of 94-88. With the loss the Gusties fall to 10-13 overall and 7-11 in the MIAC while the Auggies move to 16-6 overall and 12-5 in the league. After Augsburg jumped out to a quick 8-7 lead the Gusties were able to counter when a Brandon Snoberger (Sr., Rice, Minn.) basket and free throw capped off a Gustavus 8-2 run that gave it a five-point lead. The Gusties held an 18-13 lead a few minutes later but the Auggies responded going on a mini run and tying the game at 20. Late in the half, with the game tied at 34, Augsburg went on a 9-2 run to give it a seven-point lead, which was the largest by either team in the half. The Black and Gold were able to trim the deficit by getting two baskets in the final 1:04 before the half and trailed just 43-40 at the break. In the first half the Auggies shot 16-29 (55.2 percent) from the field including 6-14 (42.9 percent) from beyond the arc, while the Gusties were 17-37 (45.9 percent) on field goals and 4-9 (44.4 percent) from three. Gustavus kept up its solid rebounding, snatching 22 boards to just 13 from Augsburg. In half number two the Gusties came out strong going on a 14-5 run capped off by a Snoberger layup to give themselves a 54-48 lead but Augsburg answered by scoring six straight to even it up. The two teams played neck and neck for the next nine minutes until the Auggies eventually took an 81-76 lead. Spencer Tollefson (Sr., New Richland, Minn.) knocked down two free throws followed by a CJ Woda (So., Maple Grove, Minn.) tip-in on the next possession to cut the lead to one with 4:15 to play but Augsburg got baskets on big possessions and made its free throws down the stretch to ice the game. The Gusties were led in the contest by Woda who had 16 points to go along with six rebounds and four assists. Tollefson had a solid night as well notching 12 points and six boards while Marten Morem (Fy., Caledonia, Minn.) was 4-5 off the bench for 11 points. The Gusties will now have a week off until they host Bethel next Wednesday for a 7 p.m. contest.